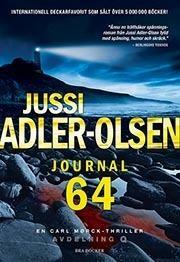 Journal 64 is danish crime author Jussi Adler-Olsen’s fourth book about Carl Mörck and Section Q. The first three books were released all three in Sweden last year and I was blown away! In my opinion it was the best books of the year so I had really high expectations for this book. The book lived up to expectations to 85% although it took a little longer to get into it than the previous books It only took one evening to read it. Anyway. I´m sure that Jussi Adler-Olsen will be a hit in Scandinavia as well as the rest of the world. Time after time Jussi Adler-Olsen writes about vulnerable people who´s life take a bad direction due to life’s injustices. This book is no exception. Nete ​​Hermanson tells us in flashbacks how her life started and how she ended up on Sprogø, the island where the state sent ‘undesirable women’ right up to the 1960s …. Section Q is a small department located in the basement of police headquarters in Copenhagen. They have been asigned to solve the so-called “Cold Cases”. Head of the department is Police Superintendent Carl Mörck who takes every chance to minimize his work load. He is a reluctant hero whose thoughts always fill me with laughter. He is, for example, completely unsympathetic to his assistant Assad exotic herbal teas and prayer mat. He believes (with some justification) that his secretary Rose is crazy and his wife’s son is staying with him even though he divorced his wife a long time ago. In this book, he also has problems with his cousin and is presented to his girlfriend’s daughter, where he makes a disastrous impression …. Both Assad and Assistant Secretary Rose carries big secrets that the author skilfully reveals throughout the series of the books. Roses secret really begins to unravel in this book. What Assad’s secret is I do not know yet but I am sure I will be surprised and that it will be interesting. I know that the first book is translated in to English and hopefully the others will follow!